If a rice cooker is advertised as being a 7-cup cooker, what does this mean? Will the cooked rice measure 7 cups? Not usually. A 7-cup rice cooker does not mean that you can make seven cups of cooked rice with it. It means the cooker size accommodates 7-cups of raw rice, which will produce a larger cooked capacity of rice, usually double, though this can vary depending on the type of rice. 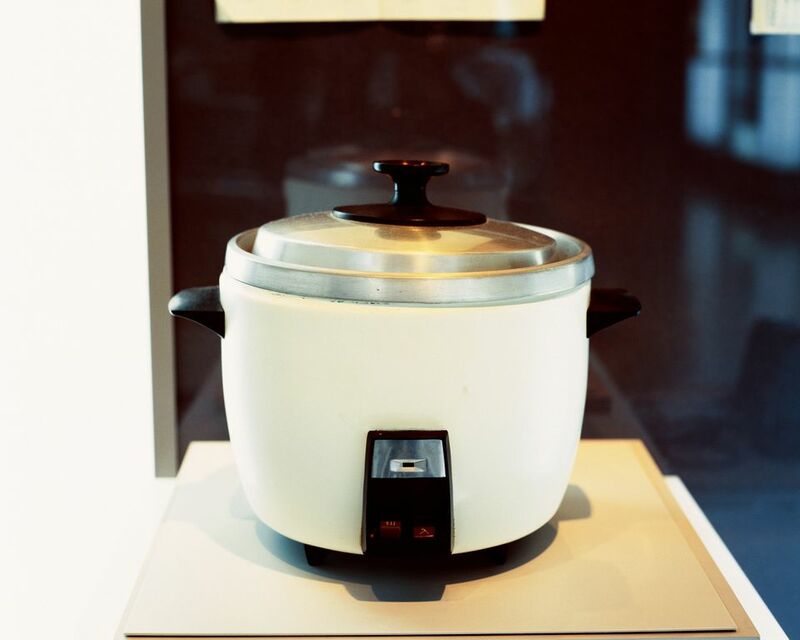 Rice cooker size and capacity can be very confusing and the key is to note whether their product relates to raw or cooked rice since not all retailers or manufacturers follow the same description and advertising practices. Note that the ad might be worded totally reversed, so details are essential when buying the best rice cooker for your needs. Rice cookers are usually sold as 5-cup, 7-cup or 10-cup size models and so on, referring to raw rice. That usually gives you an idea of how little or what the minimum raw rice amount is, as well as the maximum (capacity). For instance, if you're looking for a rice cooker for two people, the more appropriate size for everyday cooking would be a 5-cup. In fact, a larger model may not be able to cook small amounts, like two to four cups. That's why capacity notations are very important to consider before buying. The 7-cup and larger capacity cookers would be more suitable for a family. With most models, you can cook much less than that amount, but there are minimums. So what size of rice cooker should you get? The end capacity (cooked rice) should meet your serving needs. If you generally cook about 3 cups of raw rice for most meals, a 5-cup or 7-cup rice cooker will more than meet your needs and you'll be able to cook more when you have dinner guests. On the other hand, if you love to have rice leftovers and have the room to store a larger cooker, go for a bigger model. If you were to cook long grain white rice in a pot on a cooktop, with the exception of specialty rice, it generally involves using a similar amount plus a little more water (example: 2 cups raw rice plus 2 1/2 cups water). This is very standard and one usually uses the same measuring cup for both ingredients. However, if you use a rice cooker, measuring can get confusing. Many rice cookers come with a handy rice cup measure and product manuals will provide cooking guides based on these measurements. While a standard U.S. cup measure is 240 milliliters, a rice cup according to rice industry standards is much smaller, at 180 milliliters. So the small cup included with your cooker is what you should use. It coordinates with the water level line in the rice cooker. There's no problem if you use the smaller rice cup for measuring both rice and water or use it to measure rice and add water to the rice cooker pot up to the related water line - which takes into account the smaller cup measurement. That's what you should do. But if you use the smaller cup measure for rice then use a standard cup for water, this makes the ingredients improperly proportioned for best cooking results. Note that most rice cookers have convenient measurements marked out on the cooker liner. Many models also include a measuring cup. This is because the general measure of a cup of raw rice is actually slightly less than an Imperial cup measure. To avoid confusion when measuring rice, simply use the measuring cup supplied with the rice cooker for both rice and water, or use a rice and water ratio based on manufacturer's instructions (for that type of rice) in the product manual. A rice cooker is ideal as an electric steamer and most come with a steaming basket for that very purpose. Not all rice cookers have a steam feature, but many do and this handy function allows you to use this convenient appliance for more than cooking rice. It also enhances the rice being cooked when vegetables are steamed at the same time. If your rice cooker has a steam feature, it will have a steaming tray or basket and a preset steam setting. While the size of the rice cooker can certainly dictate the maximum size of steamed foods, this is still one handy feature to have. And you can steam more than vegetables—try meats or make a steamed dessert. It's a great way to tenderize meat for pulled beef or pork. To use the steam function, cleaned and cut vegetables should simply be placed in the basket. You can place those with stiff peeling such as squash or pumpkin, turned flesh down. Use foil in the steaming basket or tray for meats or fish and cover with foil to keep flavors in during the steaming process. This foil wrap also keeps your added seasonings in with the meat. Cooking white rice in a rice cooker usually takes around 35 minutes, but vegetables will steam-cook in a much shorter time—roughly from 5 to 15 minutes depending on the vegetables. For this reason, add the filled steam tray only part-way through the white rice's cooking cycle. Using a rice cooker to steam vegetables will alleviate congestion on your cooktop and produce very tender, flavorful sides. It's also handy for steam-cooking pumpkin sections before peeling. Allow the steamed pieces to cool and spoon the vegetable pulp off the peel for pumpkin pie filling. Follow your product guide for hints regarding steaming times, but keep in mind that even these will vary depending on the toughness of vegetables and other conditions such as altitude and humidity levels. Larger vegetables such as squash or pumpkin will need to be done in more than one batch, with sections cut to size to fit properly in the basket. But steaming cycles are fast with a rice cooker, so even multiple cycles will steam quickly. Experiment by steaming meats and vegetables, and ensure meats reach a safe cooking temperature, which you can monitor with a meat thermometer. Always clean your rice cooker properly according to the manufacturer's cleaning guide.